Please pay by MobilePay or put the money in the "money barrel" just inside the door. Members of Foreningen Gamle Sønderho: Free. 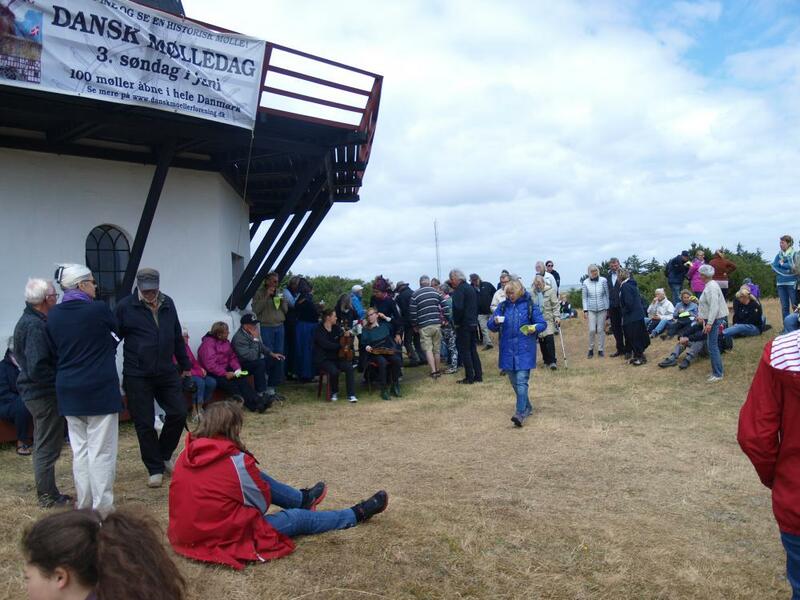 Sønderho Windmill is open from Saturday before Palm Sunday until November. Guided tours for groups can be arranged through info@fondengamlesonderho.dk or telephone +45 5150 1850. In 1928 the Foundation bought the Dutch gallery windmill, which was built in 1895. 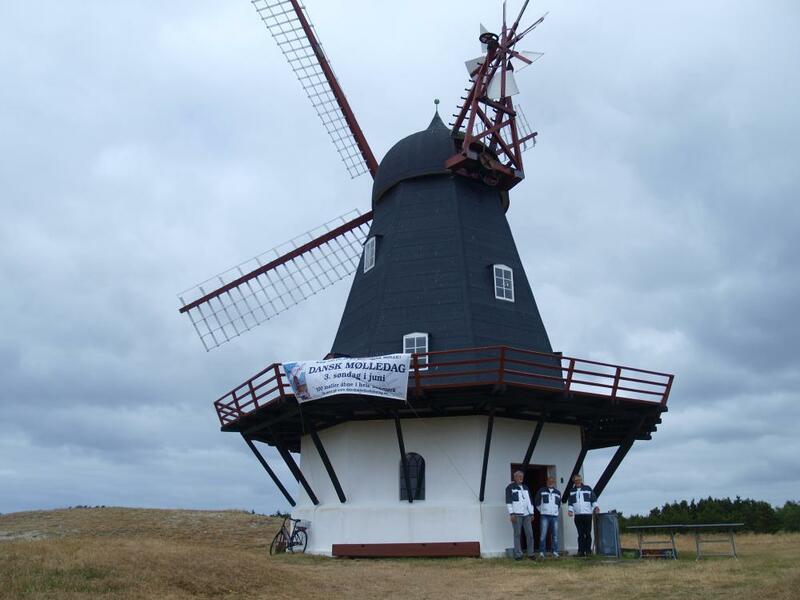 The windmill which was condemned, has since been restored gradually, and was inaugurated in its present form in 2003. The windmills inspired but simple construction builds upon centuries of experience and an impressive ability to keep balance. The skeletons eight upright beams are actually not fastened to the windmills brickwork, and the hat - with its wings, wing axel, wheels and swingwheels -rests upon 8 small iron bricks, that glide on an iron band at the top of the skeleton. It is the weight of the whole construction that keeps it upright - in storm and good weather! The present windmill in Sønderho was built in 1895 after the "dutch building method" as a cornwindmill. The mill building is eigth sided with a brickbuilt base (undermill) while the body and hat of the mill are wood constructions. Apart from the undermill there are three floors or lofts in the mill: a high grinding loft, a very low starwheel loft and a hatloft - as well as the hats layer of beams. On the grinding loft level there is an outside gallery, where the miller could reach the wings. He could also work the brake system and regulate the wing flaps. The wind rose - the little eight-winged wheel on the hat - enables an automatic turning of the hat, so that the wings always face the wind. 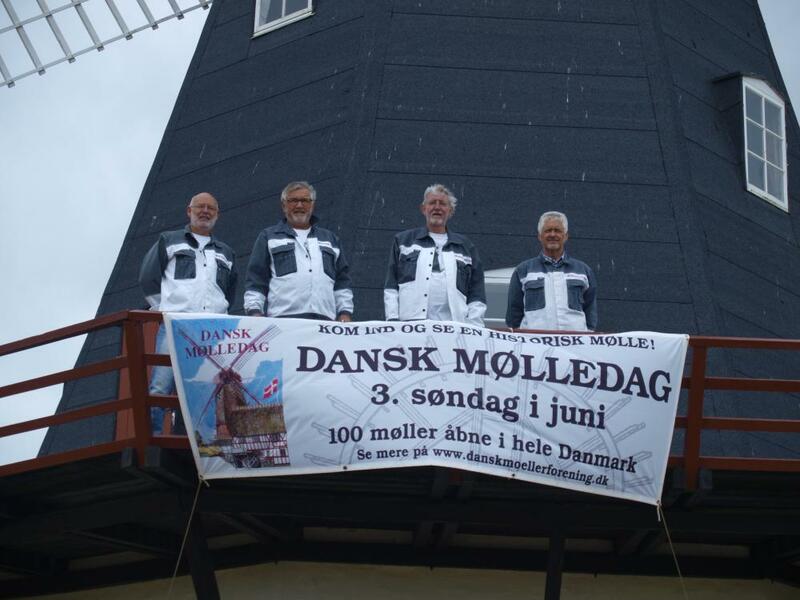 Foundation Gamle Sønderho invites all to the National Windmill Day, on the third Sunday in June, every year. See Activity calendar. The windmill is open and one can see how corn is milled into flour. 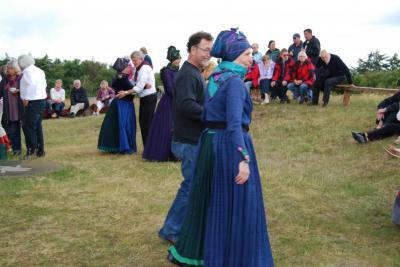 The National Windmill Day is celebrated with music, song and dance. Coffee/punch, Sønderho pastry, beer and soft drinks are available. 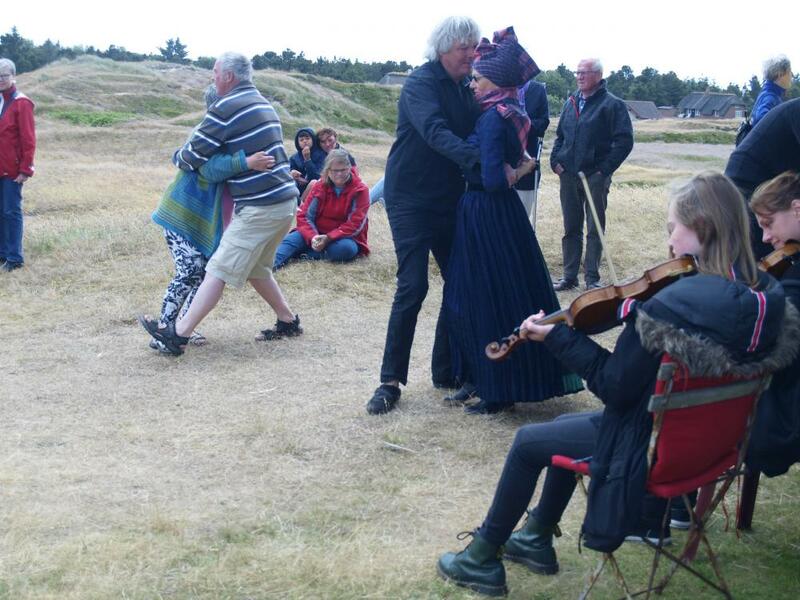 Come and enjoy, you are very welcome in the Fanø dress, dance shoes and good spirits on the Møllebanken. We can help with fastening the scarfs from 1pm in the windmill. In 1928 the artist Heinrich Dohm and Journalist Niels Th. Jerne bought Sønderho Windmill and the windmill house on behalf of Foundation Gamle Sønderho, which was in the process of being established with the purpose of preserving the windmill. Despite the fact that the windmill had only been in use for 28 years, it was, because of bad maintenance, almost a ruin. If it was to be preserved for the future there was a need for a great deal of repair. 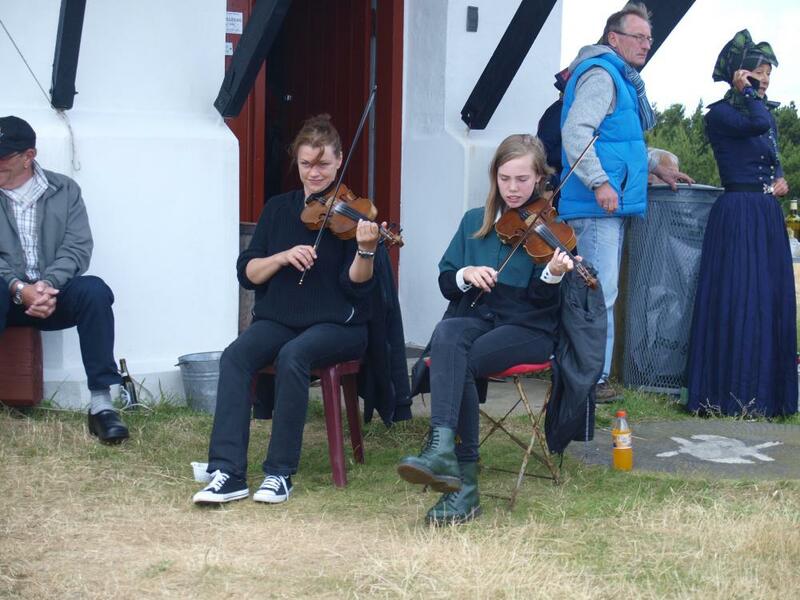 At the Sønderho day in 1930 the windmill was reopened - there was no wind wheel or gallery - and the Foundation could after various difficulties take over the windmill whilst Dohm and Jerne could keep Mill house which proceeded to fall into more disrepair. The barn had fallen down in 1923, and a storm in 1935 took the whole of the east end of the house, because the internal walls and beams in the stable have been removed. The Foundation took over the Mill house in 1937 with the idea of making it into a museum. It became apparent that this could not be done and the house was sold in 1940. At the Sønderho day in 1943 a new gallery was opened. Money for this was raised by selling the crowndrive, headaxel, starwheel and drive, which were all made of cast iron. 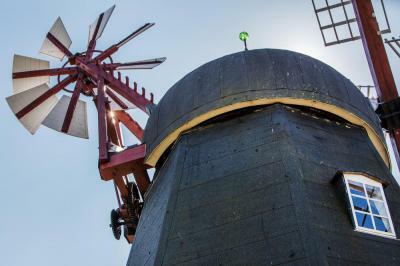 Since 1928 the Foundation has worked for at maintaining and restoring the windmill. In 1973 the Foundation received a legacy of 100.000 kr from Hedeman Sørensen, a deceased farmer in USA and son of the last miller in Sønderho. The interests from this legacy are used for maintenance of the mill. Over the years nearly everything in the mill has been renewed and repaired, so that the mill today is intact and well maintained. The storm Bodil in 2013 caused great damage. The hat wheel was smashed and had to be replaced. At the same time one of the wings had to be replaced as well as the main wheel for turning the hat. Insurance company TopDanmark acknowledged the damage as being a storm damage and paid for a new hat wheel. Replacement of the wing and main turning wheel was paid for by Sydenergis Vækstpulje and the Ministry of Culture. Read more about old Danish windmills here. 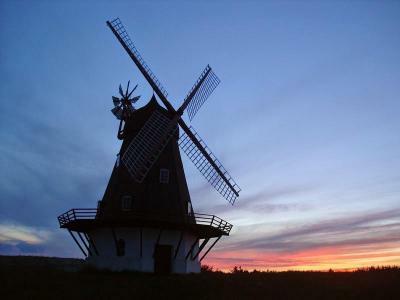 Read about the history of the windmills here.